On “Millennium” Fort Lauderdale underdogs Monstrosity manifested itself as a veritable force in the Florida death metal scene. Whereas its “Imperial Doom” debut was heavily redolent of Malevolent Creation, the band from whence Lee Harrison came, “Millennium” conclusively proved that Monstrosity was compositionally – and technically stronger than a good deal of its regional, more marketable peers. Despite its obvious merits Monstrosity remained only in the second-tier status as its frontman George Fisher would soon decamp to front the iconic Cannibal Corpse. Disagreements concerning the distribution of royalties resulted in a split with Nuclear Blast Records. The termination of contract with Nuclear Blast Records led founder Lee Harrison to release future Monstrosity efforts through his own label imprint Conquest Music Group. Conquest Music handled distribution and marketing in North America, while Nuclear Blast and Hammerheart Records licensed it for European territories. A few changes in the personnel happened Death alumnus Kelly Conlon replacing Mark van Erp on bass guitar, and Jason Morgan substituting for Jon Rubin. Despite these changes former members Jon Rubin and Mark van Erp contributed to a few songs, while the majority of “Millennium” was written by Lee Harrison and Jason Morgan. While its kinship with Malevolent Creation remains obvious through its writing Monstrosity offers everything you’d expect of a Florida death metal act. Lee Harrison is probably one of the best drummers in the region, and it's somewhat insulting that he’s still considered second-tier by many. “Millennium” is technical, and thrashy in equal measure while offering bouts of melody and groove simultaneously. Whereas on “Imperial Doom” Harrison’s drumming was mostly about speed on “Millennium” his playing truly becomes integral to each of the cuts. Some of his best work is to be found on tracks as ‘Devious Instinct’ and ‘Dream Messiah’. ‘Fragments Of Resolution’ is the sole dirge-tempo track of the album, and gives Morbid Angel a run for its money. On his swansong appearance with the band frontman George Fisher, who would soon decamp to join the much more marketable Cannibal Corpse, is in fine form. His ascending-descending vocal lines, much to Harrison’s credit as a songwriter, are legendary. All music was written by Jason Morgan and Lee Harrison, except ‘Manic’ and ‘Stormwinds’ were written by Lee Harrison and Mark Van Erp, ‘Manipulation Strain’ and ‘Slaves and Masters’ was written by Jason Morgan, Lee Harrison and Mark Van Erp. The latter also has the only lyrical contributions from frontman George Fisher with this band. ‘Manic’, ‘Stormwinds’, and ‘Slaves and Masters’ were re-recorded from the self-distributed 1994 “Demo ‘94” tape. ‘Seize Of Change’ was written by Jon Rubin and Lee Harrison. The album features guest vocals by Jason Avery on ‘Devious Instinct’, ‘Dream Messiah’, ‘Fragments Of Resolution’ and ‘Slaves and Masters’. Avery, a veteran of local death metal unit Eulogy, would come to supersede Fisher who moved on to bigger opportunities with fellow genre specialists Cannibal Corpse. “Millennium” was recorded and mixed at Morrisound Studio with Scott Burns handling the production. The Scott Burns mix was found unsatisfactory, and the album was remixed at Criteria Recording Studios by Keith Rose and Scott Kieklak. Compared to the gritty and lively “Imperial Doom”, “Millennium” sounds rather dry and sterile. Harrison’s drum tones have gained in range and textural depth but don’t possess the same amount of body as they did on the band’s debut. Monstrosity inadvertently became a victim of 1990s computer generated imagery with its Richard Dunn canvas. Unfortunate early digital art aside “Millennium” is a formidable genre exercise. Despite cementing Monstrosity’s status as one of Florida’s most accomplished units “Millennium” never quite catched on as records of the time from the likes of Deicide, Malevolent Creation, or Morbid Angel. Widely regarded as one of the best Florida death metal acts the output from Monstrosity isn’t as profuse as some of its more popular and prolific brethren. Its outstanding and consistent level of high quality product has only been matched by Waldorf, Maryland icons Aurora Borealis or Poland’s Lost Soul. 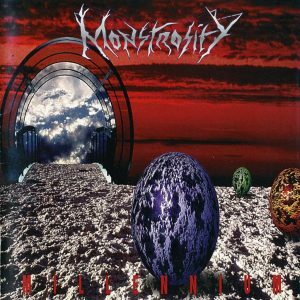 Reliability, despite the fluidity of its line-ups, aside Monstrosity is still considered a second-tier band despite its penchant for perfection, and aversion towards making artistic compromises. For that reason alone Lee Harrison and his cohorts deserve accolades for remaining true to their vision, and keeping their collective integrity intact where lesser bands would've fallen before similar hardships.